Many different species of lawn weeds produce purple flowers, but some of the blooms are larger than others. Thistles are probably one of the easiest weeds to identify that bear purple flowers, but their flowers are large. You’ll need to properly identify the purple-flowering lawn weeds in order to determine how to get rid of them. Weed treatments can vary depending on whether the lawn weeds are annuals, perennials, broadleaved or grass-like. Nearly all lawn weeds that bear small purple flowers are broadleaf weeds, however. Identify the purple-flowered lawn weed by where it’s growing. Wild violets (Viola papilionacea) and creeping speedwell (Veronica filiformis) grow in shady, fertile, moist lawn areas, and the chicory weed (Chichorium intybus) can grow in sunny, dry and infertile locations. Henbit (Lamium amplexicaule) is a winter annual that tends to grow in fertile lawn areas with thin turfgrass, but it doesn’t usually persist after the grass density increases or into the following spring. Study the flower shape to identify the lawn weed. Wild violets have delicate flowers with typically five petals and many stamens in the center of the bloom, and creeping speedwell has four-petaled flowers with purple to bluish outer petals and creamy-white centers. 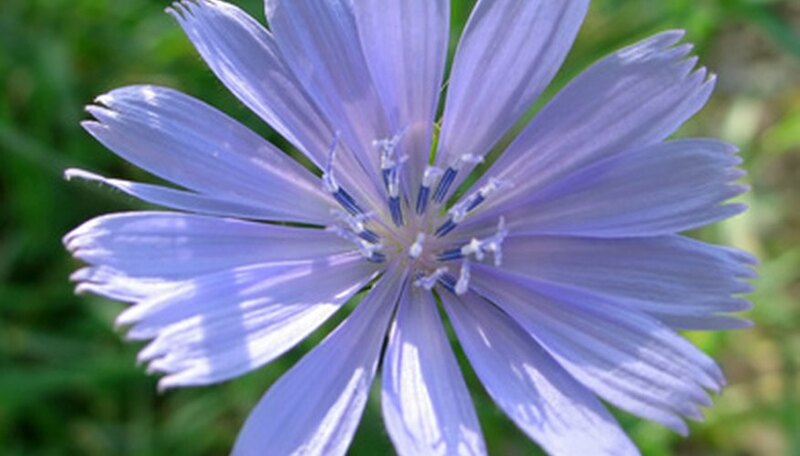 Chicory’s bluish-purple flowers have many petals with jagged petal tips, and ground ivies (Glechoma hederacea) have orchid-like, slightly funnel-shaped purple flowers that are often hidden beneath the leaves. The heal all (Prunella vulgaris) has hundreds of pineapple-shaped flowers that grow above the leaves. Look at the leaves of the purple-flowered lawn weed. Wild violet weeds have waxy, heart-shaped leaves that cup at the petiole to create a funnel shape, and creeping speedwell weeds have rounded leaves with wavy edges. 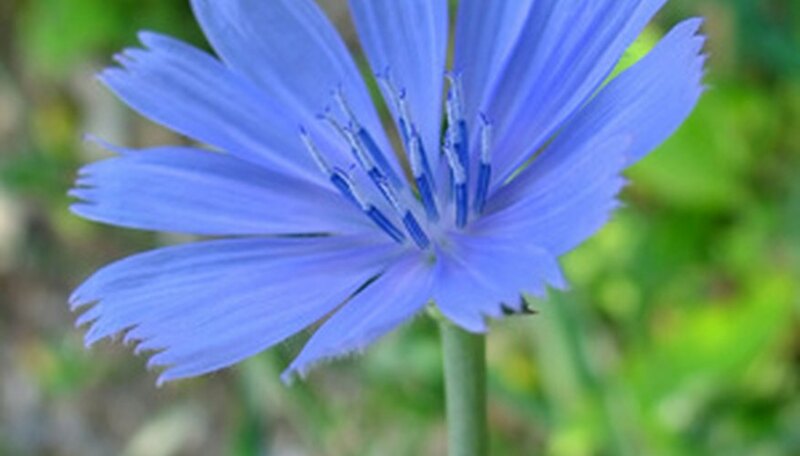 Chicory weeds have rosettes of 6- to 8-inch-long bottom leaves with coarsely-toothed edges, and corn speedwell weeds (Veronica arvensis) have round to oblong leaves with rounded teeth on the edges, but the leaves on the flowering branches are narrower. Ground ivy has round leaves with scalloped edges that exude a strong mint odor when crushed. Study the stems to make the identification. Creeping speedwell and ground ivy spread by above-ground stems, or “stolons,” and the chicory weed has non-branching, erect, thick stems with few leaves. Henbit weeds have slender, erect stems that bear the purple flowers at the tops. 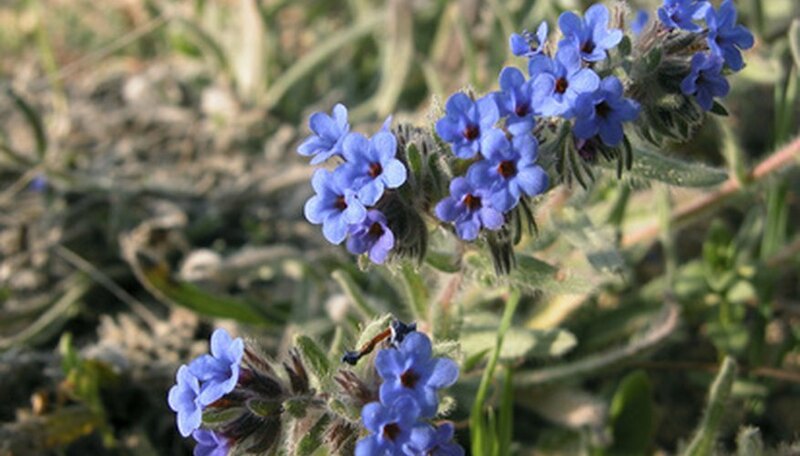 Identify the lawn weeds with small purple flowers by their growth patterns. Wild violets are low-growing, clumping and have fibrous but dense root systems. Corn speedwell weeds can form dense patches that are up to 4 inches across from a single plant, and the heal all weed has a low-growing, groundcover-like growth habit. Also, notice when the lawn weeds are flowering. 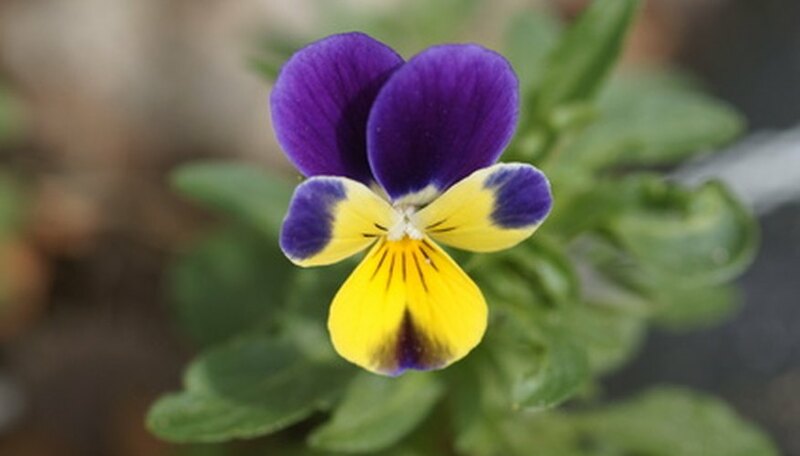 Wild violets begin blooming in mid-May, creeping and corn speedwell weeds bloom in spring, chicory weeds bloom in late summer, ground ivy's flowers bloom for a short period in mid-May, and the heal all produces flowers in early to mid-summer. The heal all weed has square stems and puckered, oval leaves that are covered with coarse, short hairs and are arranged opposite each other in pairs along the stems. Henbit's leaves clasp the stem without an attaching petiole. Don't confuse creeping speedwell with Germander speedwell (Veronica chamaedrys), which has oppositely-arranged, narrow leaves that are somewhat elongated instead of round like the creeping speedwell. Germander speedwell also produces tiny heart-shaped fruits.